JetBlue Airways continued to grow traffic and capacity in March with revenue passenger miles and available seat miles increasing 7.9% and 12.6%, respectively. Traffic growth allows JetBlue to improve its load factor and strategically invest in expanding capacity to take advantage of the healthy economic conditions. Fourth quarter results showed margin pressures that are expected to continue in 2019. JetBlue must execute on cost reduction plans. I believe JetBlue is an intriguing company given its track record and growth potential; however, it must fend off competition from other low-cost airlines. JetBlue Airways' (NASDAQ:JBLU) business position is an attractive long-term growth investment opportunity; however, the company hasn’t been effective in controlling their costs with earnings coming in lower than last year’s earnings. With the stock trading at a premium compared to competitors and no plan to reverse course, I’m staying away from the company’s stock for the time being. I will continue to monitor changes in the company’s business and reevaluate given their attractive market position. The company reported another impressive month of traffic results in March 2019 continuing its solid performance after a superb 2018. JetBlue, which is less than half the size of the three largest airlines - Southwest (NYSE:LUV), Delta (NYSE:DAL) and United (NYSE:UAL) - saw increases to revenue passenger miles (RPMs) and available seat miles (ASMs) metrics of 7.9% and 12.6% respectively for March 2019 compared to March 2018. Both metrics were above the full year 2018 metrics of 7.7% and 7.1%. Additionally, the metrics were above year-to-date 2019 metrics of 7% and 8.7%. It’s encouraging to see the maintain mid single-digit RPM growth with another high growth month in March 2019. RPMs and ASMs have been up 8.4% and 8.3% from March 2018 through March 2019. Additionally, it’s encouraging to see ASMs growing at a similar clip as RPMs with less than 0.1% difference between the two metrics over the past 13 months which is helping to improve the passenger load factor. RPM and ASM growth has a direct impact on Passenger load factor. Passenger load factor is an important measurement for airlines because it represents capacity utilization. It essentially shows the efficiency of the airline to fill seats and generate revenue. If an airline is increasing ASMs but decreasing RPMs, it shows that a lot of flights aren’t at capacity and are a missed revenue opportunity. 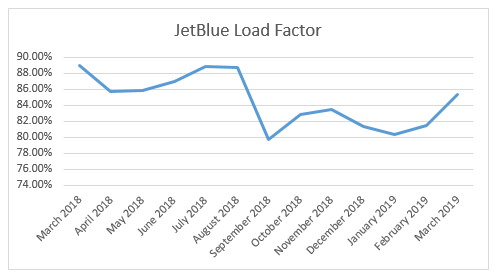 In March, JetBlue’s load factor of 85.3% lagged slightly on March 2018’s rate of 89% but improved slightly on February 2019’s rate of 81.5%. In addition to dropping from last year’s metric, the metric was lower than one of JetBlue’s main competitors, Delta reporting domestic only load factor of 86.9%. 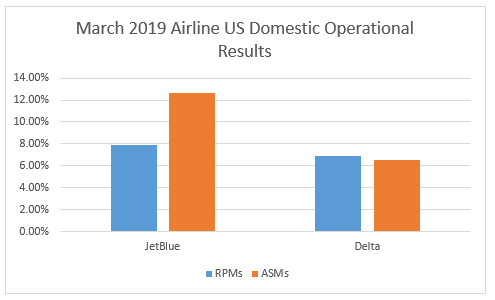 See how JetBlue stacks up against Delta in terms of domestic RPMs and ASMs below. It’s clear that JetBlue’s load factor is decreasing as a result of the high ASM growth compared to Delta. There are two main factors making up the load factor metric. The first one is RPMs, which measure the traffic for an airline and are calculated by multiplying the monthly number of revenue-paying passengers by the total distance of flights. JetBlue’s RPMs increased 7.9% year over year to nearly 5 billion miles. This growth rate just ahead of Delta’s domestic growth rate of 6.9% with nearly 13 billion miles. As evidenced by the much lower miles, JetBlue still has a lot of room to expand with United, Southwest, and Delta’s RPMs each over 10 billion RPMs in a typical month which is almost 3 times the size of JetBlue’s metric. The growth seen by the major airline is consistent with a recent report from AAA. AAA attributes higher wages and more disposable income for higher travel over the 2018 holidays. They projected that this economic environment resulted in 4.4% more Americans traveling 50 miles or more for the holiday compared to last year. This number, 112.5 million, is the highest level since AAA started tracking holiday travel. While most of this relates to travel via automobile, holiday-related air travel was projected to increase by 4.2% compared to last year’s holiday travel. This increased the total to 6.7 million passengers and clearly drove December’s traffic metric. 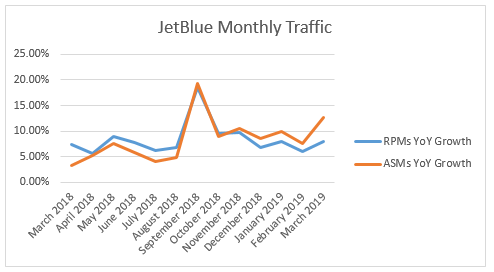 The higher traffic plus JetBlue focusing on getting more revenue out of each ticket by raising fees is helping to drive revenue. The other factor, ASMs, measures the airlines' flight-carrying capacity and is calculated by multiplying the monthly number of seats available for passengers by the total distance of flights. JetBlue’s ASMs increased 12.6% year over year to 5.5 billion miles. This is in comparison to Delta’s domestic metric of 6.5% to over 15 billion miles. Given the size, JetBlue at 5.5 billion vs. the others each at nearly 3 times that in a typical month, JetBlue clearly has a lot more room to grow and the higher year-over-year increases should be expected. This was clear in the 4th quarter earnings when management provided ASM growth guidance of 7.5% to 9.5% for the 1st quarter of 2019 and 5% to 7% for the full year. Regardless of this, the capacity is available, it’s more important to understand how management is going to fill those seats to increase the load factor. While the increased travel noted above by AAA will certainly help, the company is banking on network reallocation from underperforming markets and higher fees from the premium cabin, baggage, etc., to grow RPMs. The company recently released 4th quarter financial statements which saw the company increase operating revenues by 10.5% from the same quarter in 2017. This was accomplished through passenger growth of 12.1% as the average fare increased slightly by 6.6%. While most of this increase was offset by the 11.4% increase to operating expenses over the same period, the company was able to drop some of the incremental revenue to the bottom line. The increase in operating expenses was largely due to the much higher fuel price in the quarter of $2.24 per gallon compared to the 4th quarter of 2017 at $1.89. This was the main story of the company’s earnings with diluted earnings per share totally $0.55 in the quarter compared to $2.03 in the fourth quarter of 2017. Management is working to address the rising fuel prices through various measures including closing poorly performing routes, adjusting frequencies of certain routes and adjusting off-peak flying. Additionally, management is always looking for areas where JetBlue can shift low-margin flying to better opportunities to help drive revenue and earnings. I will be monitoring first quarter earnings to see if the company’s results start to show improvement in these areas. These margin issues along with questions on the ability to continue growing revenue in the future are weighing on the stock price. From a valuation standpoint, JetBlue’s stock appears to be very cheap at a P/E ratio of around 12 largely due to the higher operating costs compared to an industry average of 11, meaning the stock is trading at a very slight premium compared to the industry average. It doesn’t look like a trend that is going anywhere as Credit Suisse released a negative report on the stock due to the muted 2019 outlook. The firm pointed toward the expectation for lower margins due to new labor deals weighing and other cost creep items. Since that report, Barclays has warned on JetBlue’s lack of traction in hitting its high-flying expectations in 2020. They cite competitive pressure and lack of improvement in margins as primary reasons for their pessimism. Even looking at the industry as a whole, it’s difficult to be optimistic about the airliners. Deutsche Bank warned that the stream of global macro data points have been less encouraging of late suggesting that the industry risks are now more biased to the downside. Additionally, the East Coast has seen delays and the Boeing issue all are challenging issues that JetBlue must navigate in the future while focusing on attracting customers and reducing margins. BAML dropped EPS estimates on JetBlue by 23% which means they aren’t buying management’s margin plans. JetBlue has announced big news in the quarter with travel service launching to London starting in 2021. This is the first time JetBlue will make a trans-Atlantic service after a lengthy launch period. JetBlue is hoping that customers will choose them over other competitors given their consumer friendly business model. Given the timeframe and flights only routing from New York and Boston, I’m not too excited but it is positive to see JetBlue expanding internationally as long as the company can become a more lean corporation. While being much smaller, it led some major competitors in regard to growing capacity, attracting customers, and efficiency. Given JetBlue’s smaller size compared to Southwest, Delta and United, it has a lot of room to grow. It must continue to differentiate itself from the ultra-low-cost carriers and the premium carriers. JetBlue is in an odd market space because it is labeled as a low-cost carrier. However, it isn't in the same group as Spirit Airlines (NASDAQ:SAVE) or Frontier Airlines (FRNT). This puts JetBlue in competition with both these ultra-low-cost airlines plus the premium carriers, and it must fight to differentiate or at least maintain a reputable service. While JetBlue’s position in the market puts the company in a great position to take advantage of the expected increase in airline passengers as a result of an improved US economy, however, the increase in operating expenses is weighing on the company’s earnings and stock. If the company is able to reduce costs, I believe the company’s stock will benefit; however, until management puts plans into action that prove to be effective, I’m staying away from the company’s stock at its current premium valuation. Disclosure: I am/we are long LUV. I wrote this article myself, and it expresses my own opinions. I am not receiving compensation for it (other than from Seeking Alpha). I have no business relationship with any company whose stock is mentioned in this article.